Below you'll find the original challenge description of this weekend. 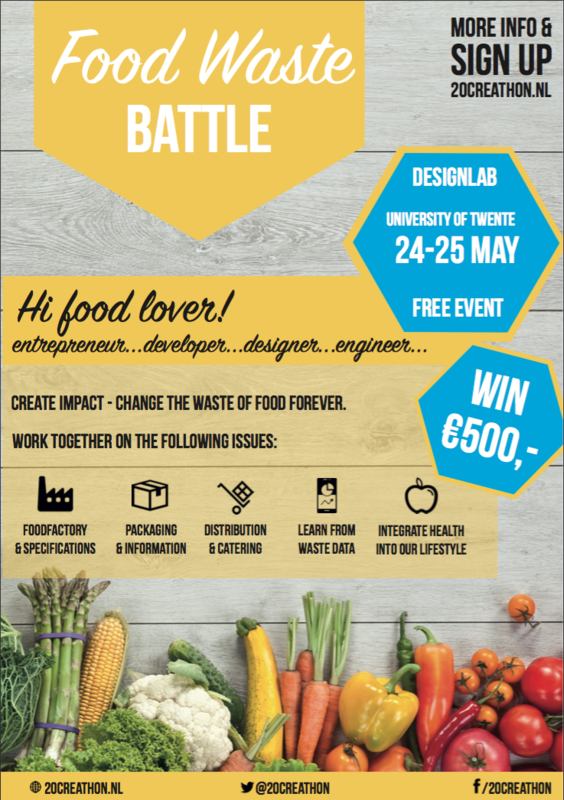 On the 24th and 25th of May, during the first edition of 20Creathon ‘Changing Events’, we pay attention to the global issue of Food Waste. Millions of people around the world are starving while the scarcity of raw materials increases and availability of agricultural land decreases. At the same time that the world population is rapidly growing, a third of all food produced for human consumption ends up as waste. The problem of food wastage is complex and can occur anywhere along the food chain from production to retail to consumption. During production, food waste can result from a lack of agricultural know-how, improper handling, transportation, or storage. On the retail side, supermarket, restaurant, and catering practices can lead to further losses. And in Western countries, consumers tend to over-buy and end up throwing away food worth billions. There stands a lot to be gained from taking on the challenge of food waste. The consumer can help, for example, by asking for a doggy bag in a restaurant. But, consumers also want to see smarter production practices. The Food Waste Battle is part of 20Creathons Changing Events. The other challenges within this subject are Safety @ Soccer and the Culture Cloud. We live in a time where an immense amount of data is available that represents a largely untapped potential for innovation, especially when it comes to complex social issues. With the Food Waste Battle, we want to change that. We invite hackers to invest 36 hours on different issues surrounding food waste. Worldwide, approximately 1/3 of the produced food is wasted. That is, theoretically, about four times the amount needed to feed more than 800 million people suffering hunger. The European Union is lost among consumers for 30 billion euros in food and another 60 billion in the production process. This is, particularly for perishable foods such as meat, fruit, and vegetables. In the Netherlands, consumers throw away more than 50 kilos of food per year. In total, this will be 800 million kilograms. Create impact – Change the waste of food forever. Does your idea has potential? You’re able to win support of Kennispark Twente to give your start-up a more concrete form. 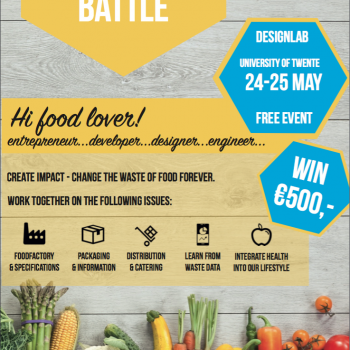 This event is organised by 20Creathon in coorporation with: WasteWatchers, Europastry, DuurzaamDoor, Packable, Walnut Food & Hospitality Management, Rijksdienst voor Ondernemend Nederland.